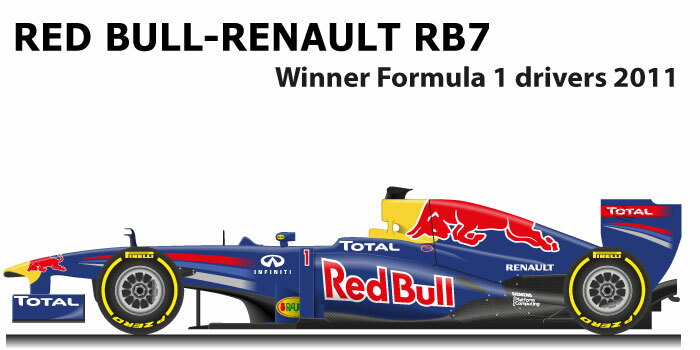 The Red Bull Renault RB7 n.1 is the dominating car of the Formula One World Championship in 2011. Adrian Newey designed the new car refining the Red Bull RB6, the fin disappeared on the rear hood and the small humps on the front, while the DRS as per the FIA ​​regulations. Sebastian Vettel driving the Red Bull Renault RB7 n.1 dominates the 2011 world championship by winning the drivers’ title for the second consecutive year. The German won eleven races: GP Australia, GP Malaysia, GP Turkey, GP Spain, GP Monaco, GP Europe, GP Belgium, GP Italy, GP Singapore, GP South Korea and the GP India. The RB7 with Vettel also got fifteen pole positions. Team-mate Webber with a win and three pole positions helped Red Bull win his second constructors title. GP winner: GP of Australia 2011, GP of Malaysia 2011, GP of Turkey 2011, GP of Spain 2011, GP of Monaco 2011, GP of Europe 2011, GP of Belgium 2011, GP of Italy 2011, GP of Singapore 2011, GP of South Korea 2011, GP of India 2011.